Chettinad cuisine is popular for its generous use of spices and flavourful taste. Chettinad chicken curry is one of my favourite dishes and this recipe is very close to that of the Chettinad chicken available in restaurants. 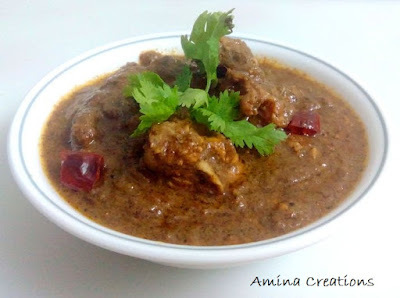 Do try this delicious curry for lunch or dinner and serve with chapathi, naan or white rice. Marinate the chicken with curd, red chilli powder and salt and set aside for half an hour. 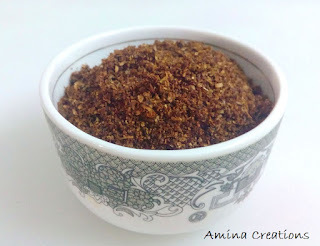 Dry roast all the ingredients of the chettinad masala powder together in a pan, allow to cool and grind to a powder. You can also grind this and store in an air tight container for later use. Now heat oil in a pressure cooker, add onions and sauté till the onions turn golden. Now add curry leaves and tomato puree and cook till the oil starts separating. Add coconut paste and cook for a couple of minutes. Finally add the marinated chicken pieces and water and mix well. Allow the steam to come out and open the lid. Add the chettinad masala powder to this and mix well. Cook for 5 to 10 minutes in low flame for the chicken to nicely imbibe the masalas. Check for taste, add salt or pepper if necessary and switch off the gas. Transfer to a serving bowl and garnish with chopped coriander leaves.